We invite you to join us on Friday, May 19, 2017 in San Angelo at Fort Concho, a National Historic Landmark, for our West Texas Regional Meeting. Registration is $40 per attendee and includes an optional Thursday evening opening reception as well as morning coffee and a box lunch on Friday. 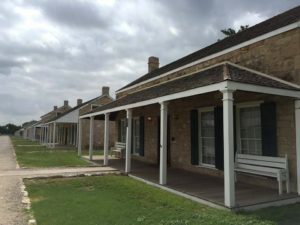 Presidio de San Saba – Terrell Kelley, Presidio de San Saba Restoration Corp. In addition, participants will learn about endangered places in West Texas from Preservation Texas, the Texas Forts Trail‘s heritage tourism and preservation efforts and the ongoing revitalization work of Downtown San Angelo. A discounted room rate of $79.00 has been made available for attendees at the Pearl on the Concho Hotel on Thursday and Friday evenings. Please call 325-653-4500 to book your reservation directly and let them know you are with Preservation Texas. The recently renovated hotel is located at 333 Rio Concho Drive, San Angelo, TX, a short walk from downtown San Angelo and a very short two minute drive to Fort Concho. We look forward to seeing you in San Angelo!